From sun drenched citrus groves, we have picked the ripest juiciest fruit at the peak of perfection, squeezed or pressed using state of the art technology, to produce the finest quality concentrated fruit juices. Our commitment and passion for coffee has driven us to source the highest quality beans, the finest recipes and the most skilful blender capable of exploiting the full flavour of characteristics to create the perfect coffee blends. Paying particular attention to reliability, C.S.S. are proud to offer dispensing systems that combine aesthetic appeal with functionality, hygiene and ease of use. In our personal lives we always wish to keep the right company. Of course the same is true in business and with Catering Services Supplies you can be certain that you have found the right company. With over 40 years experience, we specialise in providing the most suitable beverages and beverage dispensing systems to match each customers individual requirements. C.S.S. are a reputable supplier with many long-term major National accounts. Our customers throughout the U.K. enjoy the benefit of the highest quality Fruit Juice, Coffee and Natural Slush dispensed through the most reliable, simple to use and aesthetically pleasing beverage systems. Our beverage dispense systems are available to purchase, rent or on free loan. 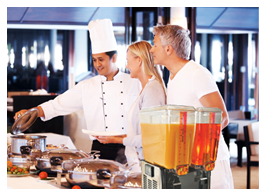 So, no matter whether you are catering in Hotel & Conferences, Education or Contract Catering, C.S.S. truly is a one-stop solution for all your Hot and Cold beverage requirements. We offer a large portfolio of products including Fairtrade, Organic and Rainforest Alliance. A comprehensive range of products and dispensing systems are supported by our highly qualified and trained maintenance department ensuring our customers can relax with total piece of mind, safe in the knowledge that they receive high quality products and prompt effective attention to all their requirements. In addition to our wide selection of coffee we offer a complete range of Tea, Chocolate, Cappuccino Topping and many other specially selected vending ingredients including a school approved low calorie Hot Chocolate and disposable items such as double wall cups and sip-thru lids.